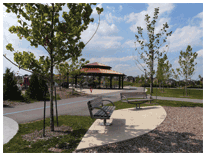 Consultants: PMA Landscape Architects Ltd.
A remnant wetland that once connected the headwaters of Sawmill Creek was the inspiration for the development of a park, a trail system and enhanced wetlands within the Churchill Meadows community. Retaining the natural habitat while developing a recreational park experience was a priority in the design of O'Connor Park. A featured trail called Cathy's Walk has become the over-riding connection to the site. The trail links the north part of the park to the south and separates the active recreation area from the passive naturalized area. The close proximity of Ruth Thompson Middle School makes O'Connor Park an obvious location for science and environmental studies classes. The houses at 860 and 864 Goodwin Road are newly constructed single-family homes adjacent to one another. 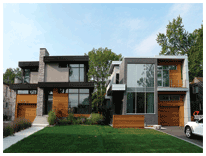 They are located in a well-established residential neighbourhood of Lakeview and have views to Lake Ontario. Both homes are built with environmentally friendly materials and include energy efficient systems such as solar panels. The Mississauga Library project is an adaptive re-use strategy for major renovations and additions to the Lakeview, Lorne Park and Port Credit branch libraries, all built between 1956 and 1967. The three renovations are structured as one project. All of the libraries are situated in park settings. 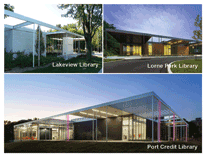 The Lakeview and Lorne Park libraries are embedded within well-established residential neighbourhoods. The Port Credit Library is adjacent to the Credit River along Lakeshore Road in the Port Credit community. The original three libraries were designed as mid-century modern buildings, displaying similar physical and aesthetic characteristics. This building is a part of Absolute World, a development comprised of a five-tower, master-planned community. 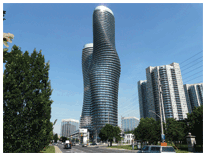 The downtown Mississauga development includes a variety of residential units, a recreational facility and retail stores. The developer intended to create an iconic building at the northeast corner of Burnhamthorpe Road East and Hurontario Street, an important and highly visible city intersection. The Phase IV building is the result of an international design competition. Today, it is known internationally as the 'Marilyn' building. The tower twists 180 degrees from its base to the top, resulting in an organic form - a unique and complex architectural design. The open forecourt includes public art, as well as hard and soft landscaping. Located at the centre of Sheridan College's new campus, Scholars' Green Park is the symbiosis of a public park and an academic common that provides quiet outdoor amenity space for the students, faculty and the surrounding community. The park contains various features such as micro-forests, outdoor cafes, a pavilion with a gathering area and public squares. Scholars' Green Park connects the future phases of Sheridan College to the north with the Living Arts Centre and the Mississauga Civic Centre.